A Roasted Vegetable BONANZA! | Keep It Up, David! Remember all those veggies I brought home from the store last week? I used a lot of them over the weekend, and I’m going to show you what I did! I got invited to a small little get-together to watch the Golden Globes on Sunday. I gladly agreed to contribute a vegetable, side or salad, and I came up with something that serves all those purposes. And it started with roasting a ton of vegetables. 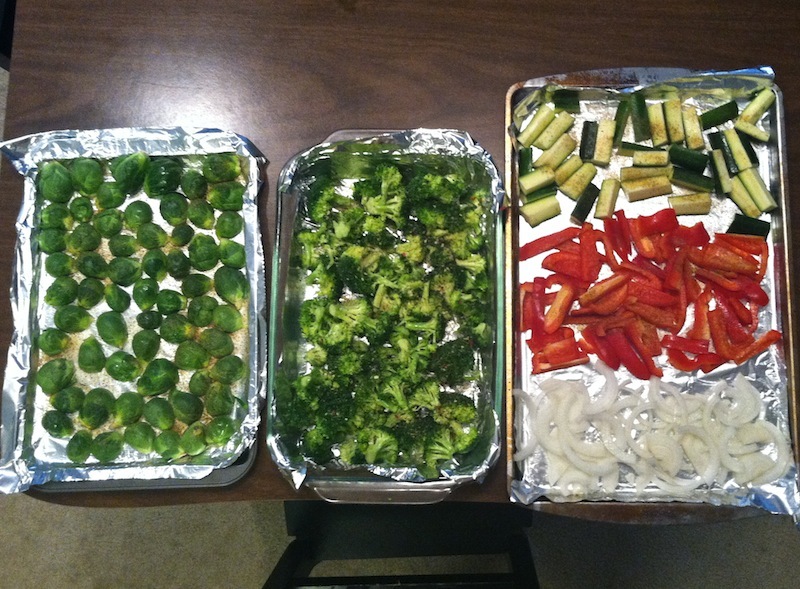 Pictured above are three trays of veggies, before they went in the oven. Brussel sprouts (halved) on the left, broccoli florets in the middle, and 3 zucchinis, 2 red bell peppers, and 1 onion, all sliced, on the right. I lined the trays with foil for easy clean-up, and spritzed all the veggies with a healthy dose of PAM before sprinkling them liberally with the Onion and Herb variety of Mrs. Dash. They looked and smelled great. They tasted great too – tender, with lots of crispy edges and charred bits. These veggies were going to be the main ingredient in a Roasted Vegetable and Kale Salad. 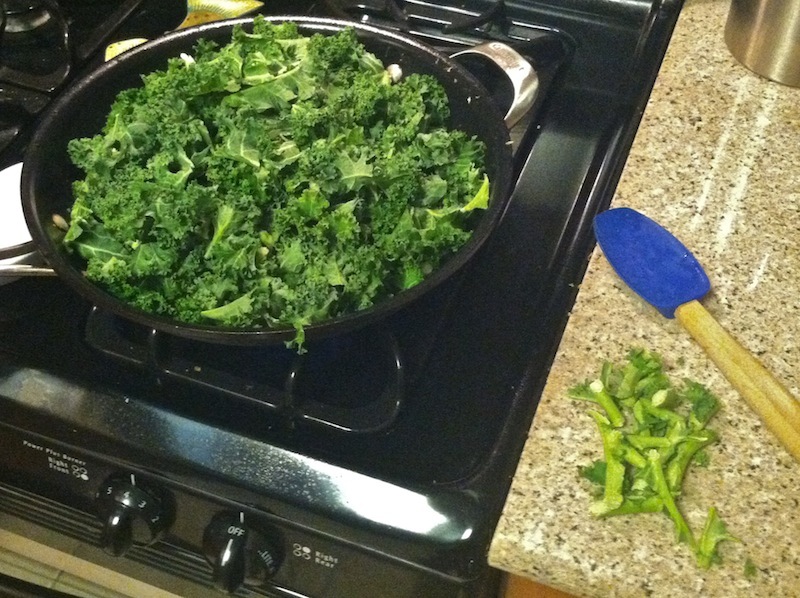 Now that the veggies were taken care of, time to focus on the kale! 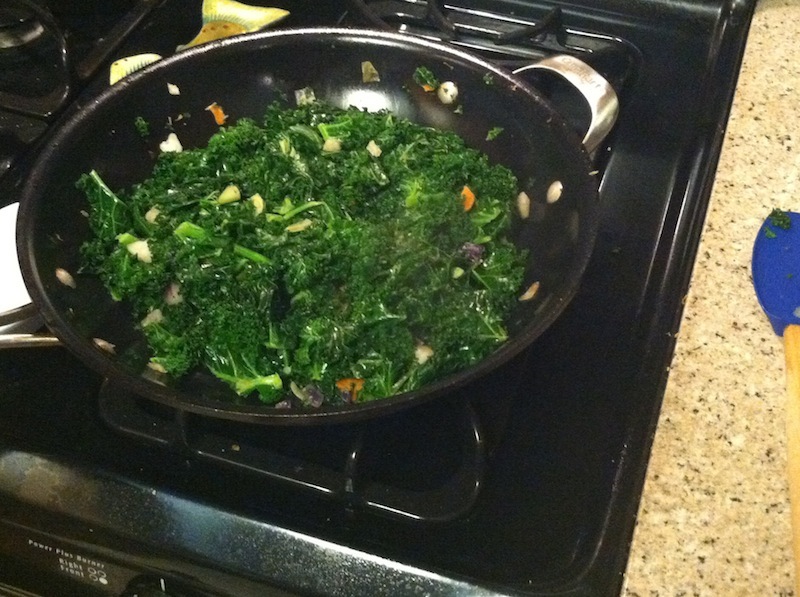 I decided to saute the kale with some other goodies, and I was able to do that while the veggies were roasting. I pulled out my big skillet, slicked it with PAM, put it on medium heat, and dumped in a couple of handfuls of Trader Joe’s Healthy 8. This is a prepared assortment of diced vegetables that’s a mix of broccoli, carrots, red cabbage, green cabbage, jicama, green bell peppers, celery, and radish. If you don’t have a Trader Joe’s near you, you can use some onion, garlic, carrots, or whatever you have lying around. 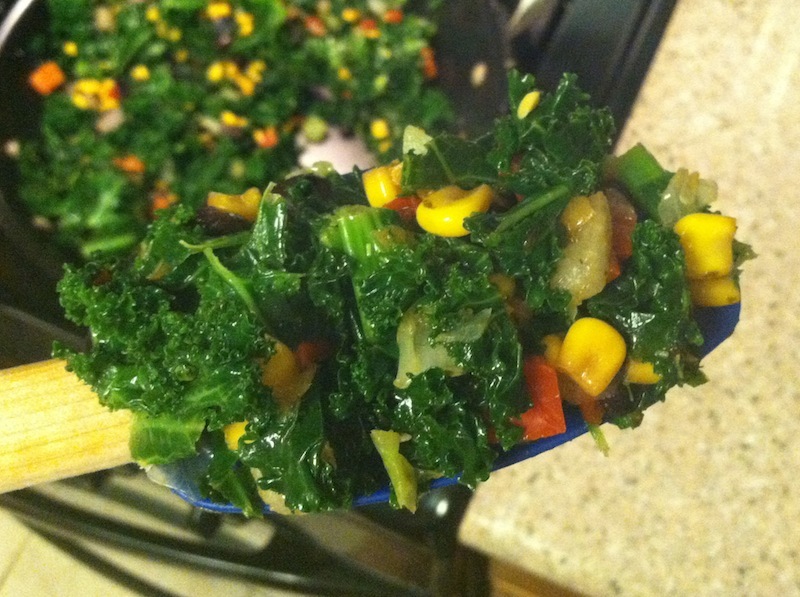 I just wanted to add some flavor to the kale… which was my next ingredient. The salsa adds a little heat, and the variety of vegetables means a lot of textures and flavors. 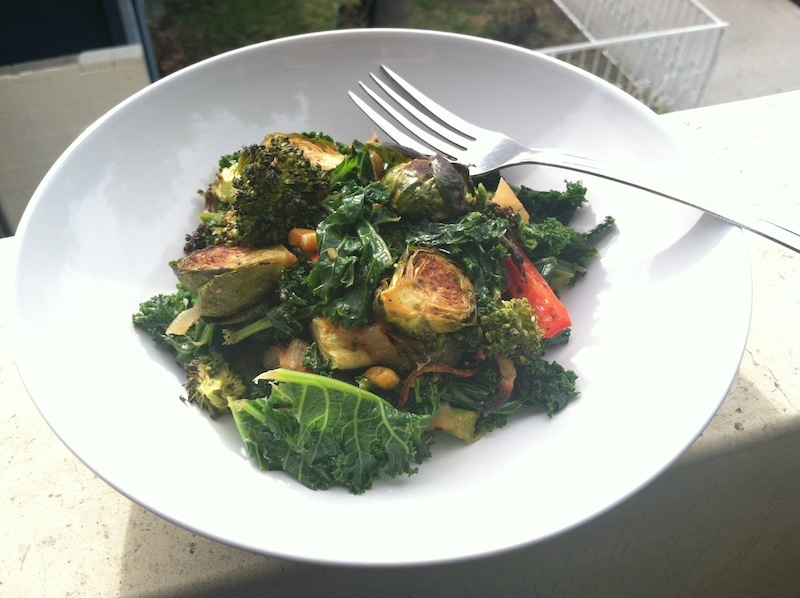 Between the roasted veggies, the kale, and the Healthy 8, this dish has 13 different fresh veggies in it! And it’s versatile as well: I ate the bowl pictured above warm for lunch, but by the time I got to the party a few hours later, it was cold… and still delicious. And here’s another tip! My friends put together a taco bar (I chose to add the salsa so it would play into the Southwest/South-of-the-Border theme), and they had a bowl of Queso Fresco as a taco topping. Queso Fresco is a light, mild Mexican cheese, similar to Feta. I sprinkled a couple tablespoons of Queso Fresco on the salad, and it tasted even better! I wish I thought of that earlier! Oh well, I can add that next time. If you can’t find Queso Fresco near you, you can use Feta, or even a little Ricotta. The salad was a hit at the Golden Globes party, and I had leftovers that would be great for my next couple of lunches. Nothing like a super-healthy salad that I can munch on for days! This entry was posted on Tuesday, January 14th, 2014 at 12:02 am and is filed under Uncategorized. You can follow any responses to this entry through the RSS 2.0 feed. You can leave a response, or trackback from your own site. 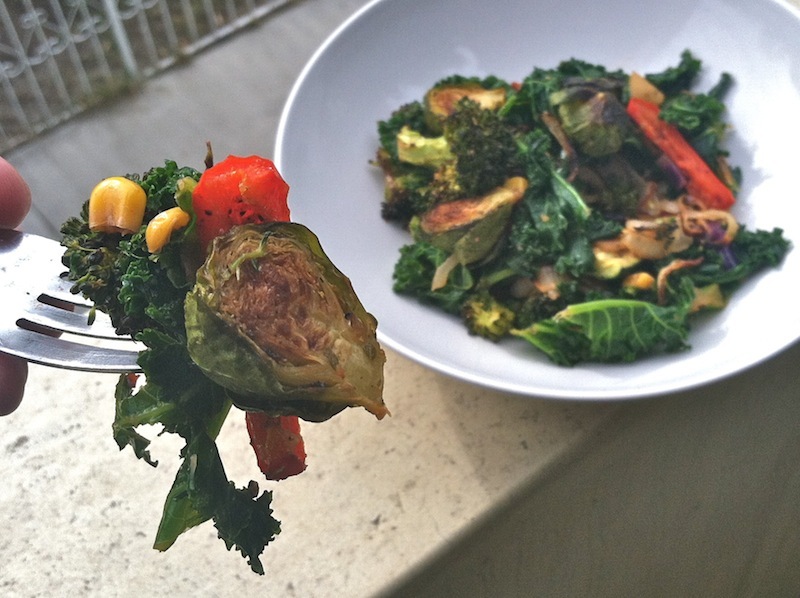 10 Responses to A Roasted Vegetable BONANZA! Did not know about the Healthy 8 but now I want some. And some of this salad. 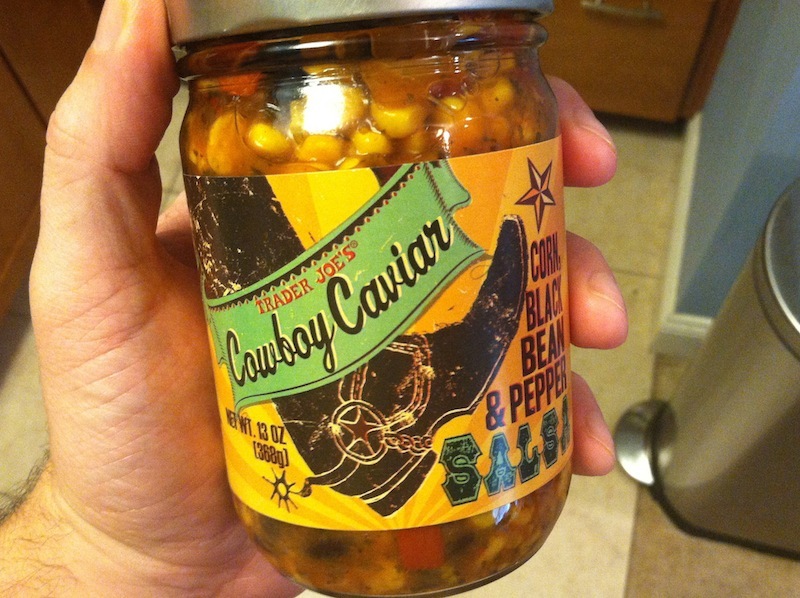 Have been making the salsa for years, jar of salsa, corn, black beans, love it on chips but also on baked potatoes. 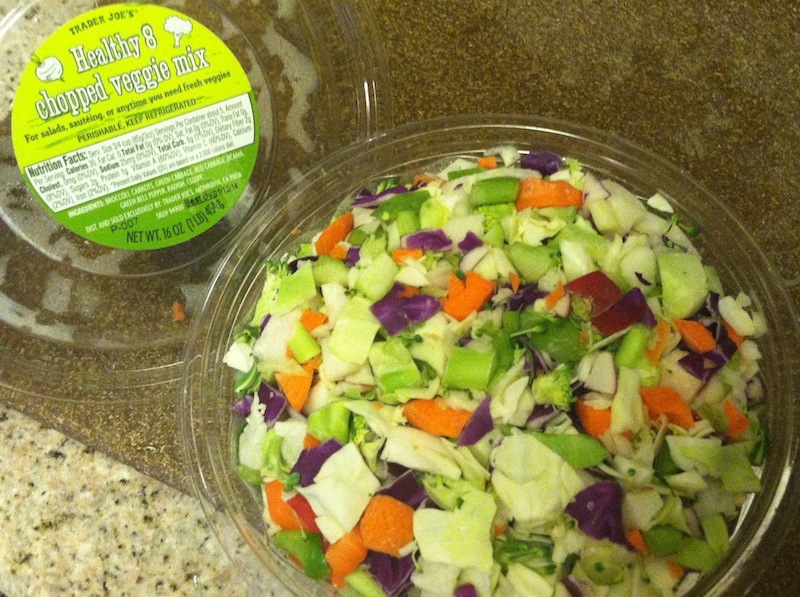 Think your left over salad would be a great addition to baked potatoes too. I am a huge fan of making potatoes into meals with addition of lots of veggies and some grilled chicken. Keep it up. You inspire me. I love the idea of salsa on a baked potato. Thanks for the idea! Keep it up! Great ideas & I have to get to trader Joe’s! Your salad sounds delicious! Our first Trader Joes’ in Colorado are opening on Valentines Day here in Colorado-can’t wait!!! They make it easy to pick fun, healthy foods, and for not a lot of money!! My dog loves the kale stems I take off my kale that I scramble into my egg whites for my breakfasts. That’s awesome! Keep it up, Catherine, and keep it up, dog! 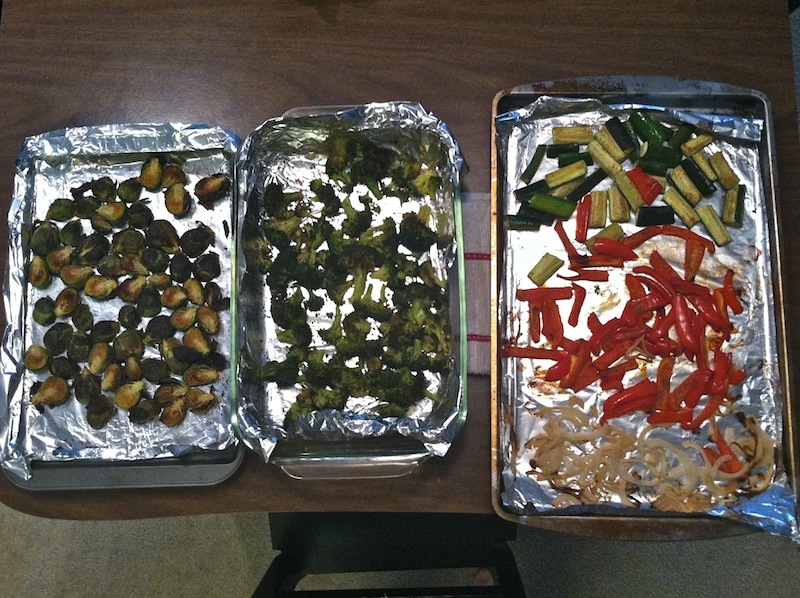 Thanks for the dinner idea — roasted veggies sound great — and I don’t mind warming up the house a little with the oven. You’re welcome – enjoy the heat!